Looking for new beauty products without having to worry if they will fit in with your cruelty-free lifestyle? The Vegan Cuts Beauty Box is an easy and affordable way to transition to a cruelty-free beauty routine, and Leaping Bunny has partnered up with them this month for a special edition beauty box! For as low as $18.50 per month, you or your holiday giftee will receive a box with 4–7 new beauty products to try, ranging from unique cosmetics to luxurious skincare. The December Vegan Cuts Beauty Box is packed with over $45 in value, and features five Leaping Bunny certified products including an obsidian eyeliner pencil by Devita and Crazy Rumors plum apricot lip balm. 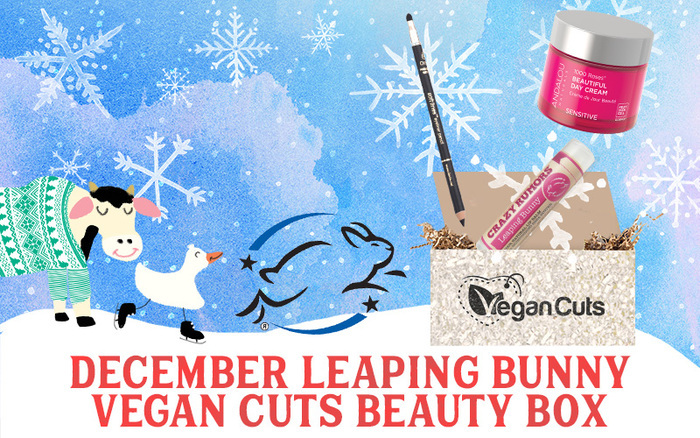 As an added bonus, Vegan Cuts will donate a portion of the proceeds of every December Beauty Box purchased through our link to the Leaping Bunny Program.